Une ancienne ferme de charme restaurée avec goût, extrêmement confortable et entièrement équipée, cette propriété de vacances indépendante de 3 chambres à coucher est riche en caractère, avec du carrelage traditionnel au sol, des poutres et de nombreuses caractéristiques d'origine. La propriété est située dans un acre de jardins naturels en terrasses, dispose d'une belle piscine illuminée la nuit et d'une grande terrasse avec une vue fantastique sur la vallée, idéale pour les repas en plein air et l'observation des étoiles. La maison est à la périphérie de la ville historique de Lorgues chargée d'histoire et avec de nombreux restaurants, cafés, vignobles et marchés. The property is gorgeous inside and out. The location is fabulous. The bedrooms are very spacious. The kitchen is fully equipped with everything you’ll need. Very family friendly, the pool is amazing. Outdoor dining patio is huge and surrounded with lovely views. The location is perfect for visiting local markets and vineyards and making trips further afield to the riviera and the gorge. So many local restaurants to chose from too. The booking and check in process was easy, the hosts left some food for us, a welcoming touch. I highly recommend this place, we drove around a lot and saw lots of other gites, but we didn’t see anything that compared to this one. Wow! What a stunning find this was. The pictures do not do this beautiful villa justice. We have just returned from 2 of the most relaxing weeks. The villa is finished to the highest of standards, with plenty of furniture inside and out. The pool was a very welcome escape from the glorious sunshine. We loved Lorgues, the Tuesday market was excellent, the choice of restaurants wonderful and all good. We were lucky to be there in festival season so also benefited from live evening entertainment at the weekends as well as a night market. We visited Monte Carlo, Tourtour (the village in the sky), Aix en Provence, Grand Canyon Du Verdon as well as a couple of Vineyards....Chateau De Berne a must! A perfect family holiday destination for all. Thank you Debbie & David for sharing your home and making everything so easy. Fabulous property in a superb location! We had a wonderful 2 week holiday and the farmhouse was perfect. The house has been renovated in a real rustic French style to a very high standard which we loved. The views from the outdoor dining area are fabulous which we enjoyed every breakfast, lunch and evening. The pool was great and much needed to cool from the beautiful Provence weather, though there was excellent protection from the sun using the many sunbeds and parasols - just relax and read a book or listen to music whilst enjoying a beer! 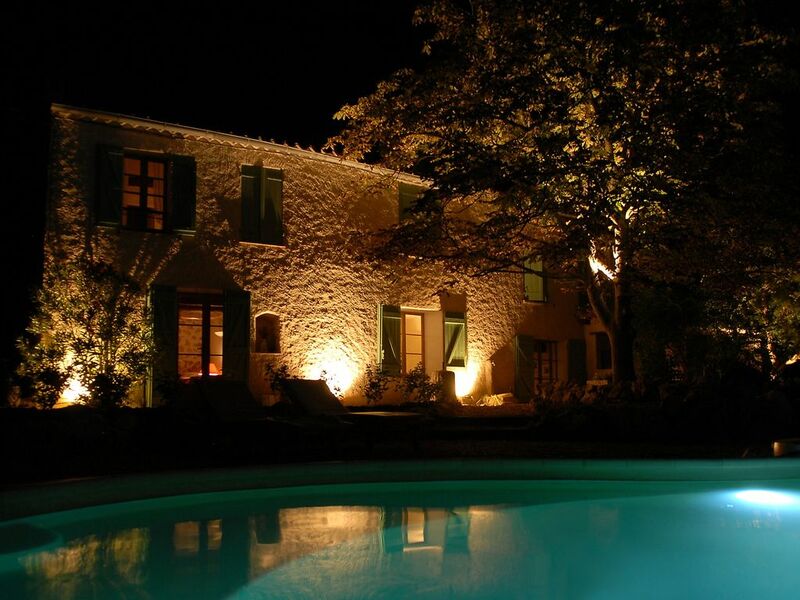 Finally, the property is located perfectly for excursions to Nice, Cannes, St Tropez or the Provence National Park. Would absolutely recommend if you want to simply relax or explore Provence. This is a really great property that has been tastefully renovated and updated by the current owners. My children are 8 and 4 so sightseeing is mostly a drag for them and so the property and especially the pool have got to be good as we will be spending a lot of time there. Both ticked all the boxes. We lazily whiled away the long, hot, Provence summer days by the side of the lovely pool. We lunched on the terrace with beautiful views over the valley and ate dinner in nearby restaurants. We didn't see any vineyards and only went to Lorgues for dinner. It was absolute bliss. This farmhouse has been beautifully renovated and very tastefully furnished by the owners, the photo album with the before and during renovation photos were very interesting. It has everything anyone requires for a relaxing holiday. Property description is spot on, lovely pool and plenty of outdoor furniture and places to sit and relax. Very clean and well maintained. We travelled as two couples and the bedroom / bathroom facilities and layout were ideal for us. All our dining was done al fresco on the large terrace. Apart from a couple of days we didn't leave the farmhouse and made good use of the pool which was a godsend as temperatures were in the mid thirties most days. The whole process from booking to our departure was handled in a very friendly and professional manner, excellent customer service. I would definitely recommend this property to others and would stay here again. Gorges du Verdon and lac de Sainte Croix are well worth a visit as well as Lorgues market on Tuesdays. La magnifique Côte d’Azur, avec son littoral spectaculaire, est à moins d’une heure de route. Saint-Raphaël, Sainte-Maxime, Fréjus et Saint-Tropez sont facilement accessibles. Aéroport de Nice à 70 minutes. Aéroport de Toulon à 50 minutes. Aéroport de Marseille à 80 minutes. Gare de train (Les Arcs) 20 minutes. La location de voiture est recommandée. Lorgues 4 km (5 minutes en voiture). À environ 20 minutes en voiture de l'autoroute A8. La propriété est à 4 km de Lorgues, une ville chargée d'histoire et regorgeant de restaurants, de cafés, de vignobles et d'un grand marché en plein air. Lorgues est nichée au fond d'une vallée, entourée de hameaux et de chapelles et est réputée pour ses vins raffinés et sa cuisine. À seulement une heure de l'aéroport de Nice, Lorgues constitue un pied-à-terre idéal pour visiter la belle campagne provençale, ses villages perchés et ses villes médiévales (par exemple Tourtour, Flayosc, Entrecasteaux, Le Thoronet (et son abbaye du 12ème siècle), Cotignac, Carces). ainsi que les célèbres Gorges du Verdon et le lac de Sainte Croix. De nombreuses activités sportives peuvent être pratiquées sur place, notamment le canoë-kayak, l’équitation et le VTT. Il y a aussi Aqualand à Fréjus et à St Maxime. Booking Notes: Changeover Day: Saturday. 4pm arrival and 10am departure. Changeover day may be negotiable for low season. Cancellations:Should a cancellation be necessary by the client, then the 25% deposit will not be returned. Should a cancellation occur after the total balance has been paid, and if you confirm your cancellation to us in writing, we will seek to re-let the property. If successful, we will normally return the balance to you (excluding deposit), less an administration charge to cover re-advertising of £100. Should we be unable to re-let the property, then the full balance will be retained. A full rental agreement is issued a the time of booking. Prices are for the property per week in UK pounds.